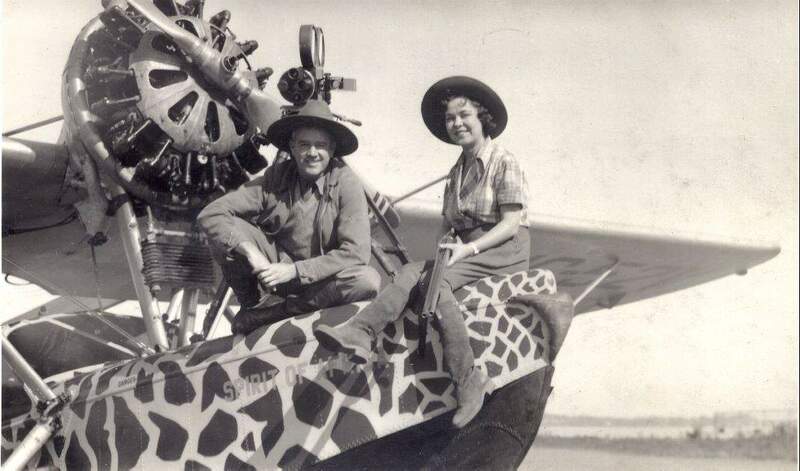 Martin and Osa Johnson sit atop Martins Sikorsky Spirit of Africa (Osa had a matching plane, Osas Ark). The couple used planes only for their final African safari in the 1930s; Martin was killed in a 1937 commercial plane crash in Los Angeles. Theres no substitute for being first, and thats probably why Osa and Martin Johnson arent household names like their contemporaries Hillary, Lindbergh and Earhart. It also depends on the household. The Johnsons achieved global fame during the 1920s and 0s when the romance and mystique of faraway lands were still just seldom-glimpsed images in the local Nickelodeon for most Americans. When real-life explorers like Osa and Martin returned from places like the South Seas and innermost Africa, there were few contemporaries who could match their celebrity. As the world has grown considerably smaller over the ensuing decades, such exploits now seem almost trite. And because they didnt actually discover anything, their names dont pop up often on Jeopardy! or Trivial Pursuit. But in the right hands  or more accurately, with the right pen  their story is one that begs to be told again and again. Vail historian Kelly Enright re-introduces the couple that time forgot in her new book, Osa and Martin: For the Love of Adventure. There must be something about Kansas that inspires wanderlust: Earhart, Dwight Eisenhower and Buffalo Bill Cody are just a few Kansans who logged hundreds of thousands of miles after breaking free of the Sunflower State, and so it was for Osa and Martin. Enrights book does much more than summarize the journals and published works of the Johnsons, of which there are many. Its no easy task to condense three decades of travel over six continents (they never made it to Antarctica) into 200 pages, and so Enright was forced at times to cover a three- or four-year expedition in less than a chapter. But what comes across are the sacrifices Osa and Martin made, beginning with Martins first trip to the South Seas in 1907 aboard Jack Londons custom-built ship Snark. For modern readers who think nothing of a six-hour flight from here to Hawaii, Enright reminds us of a time when the journey really meant more than the destination. As readers, were forced to consider the privations, frustrations and downright boredom of weeks, months and years spent aboard a small ship with a few primitive onshore stays peppered in to break the ennui. Martin met and married Osa in a whirlwind courtship while he was on his first lecture circuit after that expedition, and whether it was planned or not, she became the couples meal ticket. An adoring public couldnt get enough of the Johnsons books and films that chronicled their global exploits during an era when most Americans were unlikely to travel more than 100 miles from home. Enright does an excellent job of conveying Osas mixed feelings: She had an explorers blood but also displayed a homesickness for a home life that didnt really exist. Osa Johnson was the perfect role model for a generation of women on the verge of a feminist revolution. She was a homemaker, devoted wife and fashion plate who also didnt blink at taking down a rhino or lion with a gun that would knock over a man twice her size. Such a dichotomy, bordering on hypocrisy, is a recurring theme of Enrights book and probably goes a long way toward explaining why Osa and Martin arent seen as heroic figures today. The Johnsons were avowed conservationists, yet I lost count of the number of trophies shot during their years in Africa. Only a few seemed to be the result of life-or-death situations of self-defense. And more than transportation has changed since the Johnsons left their mark on the world. Osa and Martin were of an Anglo generation that, intentionally or not, acted with a racial superiority that was typical of 19th- and 20th-century imperialism. They gained access to primitive tribes such as the Big Nambas of Malekula by learning the language, living with the people and earning the natives trust. But there was never any question about who was civilized and who wasnt. And as their success increased and the money came easily from investors looking to cash in on their films and books, the Johnsons became almost caricatures of the white explorer  lots of khaki and pith helmets and an entourage that was more fitted to royalty than rugged outdoorsmen. Their second major foray into the African interior, for example, included 250 trunks and crates and an army of more than 60 porters to transport it all. Only the Johnsons and a select few lived in the tents and huts erected; most of the nearly 100 hangers-on spent their nights uncovered for months at a time. In Osa and Martin, Enright illustrates both the remarkable feats and pioneering spirit of Americas past as well as the questionable attitudes that made those feats possible. The book should strike a particular nerve with adventurous Durango readers, who should find a new appreciation for things such as Gore-Tex and four-wheel drive. Add it to any must-read list for the holidays, and those layovers wont seem so bad by comparison. 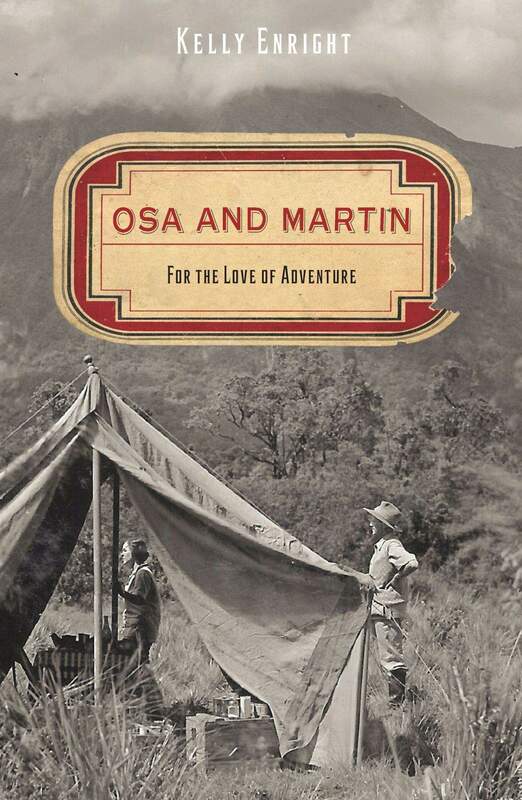 Osa and Martin: For the Love of Adventure, by Kelly Enright, Lyons Press, 222 pages, hardcover, $24.95. Enright will speak and sign copies of the book at 6:30 p.m. today at Marias Bookshop, 960 Main Ave. For more information, call 247-1438 or visit www.mariasbookshop.com.